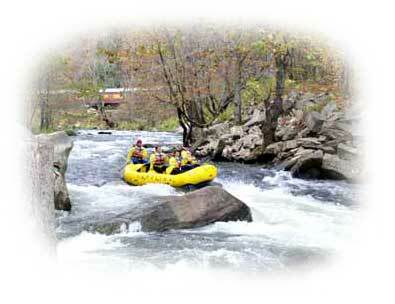 Enjoy the excitement of whitewater rafting on the most popular river in the United States! We are located in the beautiful Great Smoky Mountains of western North Carolina. Our scenic, family friendly river has an abundance of class 2 and 3 whitewater for a thrilling whitewater ride that will be the highlight of your vacation! Carolina Outfitters is an industry leader with 19 years of experience in delivering great whitewater rafting experiences to thousands of happy customers. We are within easy driving distance of Atlanta, Chattanooga, Knoxville, Asheville, Charlotte and Greenville/Spartanburg. We offer outfitting for small families or large groups. You will want to return again and again to raft the clean cold waters of the Nantahala with Carolina Outfitters! In addition to offering Nantahala River family whitewater rafting, Carolina Outfitters offers Nantahala gemstone mining adventures where participants are finding gem grade rubies, sapphires, emeralds, and a variety of other precious gems. We reserve guided horseback riding trips into the Nantahala National Forest in the scenic back-country of the Nantahala Gorge. We reserve a variety of scenic train tours on the Great Smoky Mountains Railway, including the popular 'Nantahala Gorge Excursion' departing from Bryson City. We also offer a variety of vacation rentals for your lodging needs, ranging from small simple Nantahala cabins to large spacious vacation homes that can accommodate larger groups. Plan your next adventure today. Enjoy quality family time. Call us for reservations for all of your vacation attractions and lodging accommodations, and enjoy the convenience of one-stop vacation shopping for Nantahala. "We liked the personal attention that was given to us at Carolina Outfitters. The pre-trip instructions were detailed and geared toward making our trip safer, and your staff checked every life jacket before we headed for the river!"